Appears and Operates in'Near New' Condition. Aggressively Priced for Quick Sale. Always in a climate controlled room/environment. Used primarily for short run specialty decals. The cutter portion of the printer has never been used. 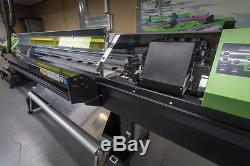 Recently serviced by Roland,'Data Ribbon' replaced along with general maintenance performed. 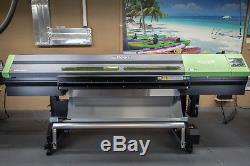 Owned and Operated by Large Format Print Company. 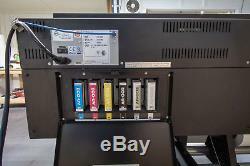 Printer is currently in Production and available for operational performance verification. Very low use of this particular printer warrants is sale. The LEC-540 is the third model in Rolands VersaUV series. The LEC-540 prints on a wide variety of flexible and rigid media, including synthetic paper, polyester film, paper and vinyl banner media, PET, leather, plastic, polycarbonates and paper boards. In high quality mode, the LEC-540 prints 25 percent faster than the 30 LEC-330 due to new larger UV-LED lamps that expedite production. LEC-540 lamps automatically reposition themselves for high-speed performance and the highest image quality in all print modes. The LEC-540 also offers high-quality artistic print mode (1440 x 1440 dpi) for images that rival offset and gravure print quality. 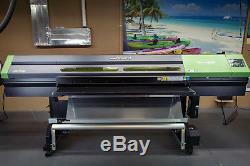 Also, available are our Roland LEC-330 and Roland LEF-20 Flatbed. 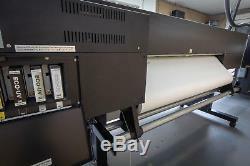 These printers were primarily used to print'Specialty Prototyping Decals' for a consumer electronic company that is no longer in business. This is'For Sale' by owner.. Sorry, NO Brokers or Resellers. 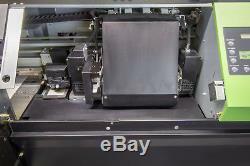 Piezoelectric inkjet / Grit roller feed. 10.2 to 54 in. 7.2 to 30 in. 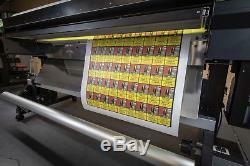 Printing: Maximum 39 mil (1.0 mm) with liner Cutting : Maximum 16 mil (0.4 mm) with liner and 9 mil (0.22mm) without liner. Maximum 8.3 in (210 mm). Maximum 7.1 in (180 mm). 2 in (50.8mm) or 3 in (76.2mm). Maximum 53 in (1346 mm). Maximum 29 in (736 mm). 220 ml (± 5 ml). 5 colors + Clear coat (Cyan, Magenta, Yellow, Black, White and Clear coat). Built-in ultraviolet-light emitter (UV-LED Lamp). 360x720 dpi, 720x1080 dpi, 720x1440 dpi, 1440x1440 dpi. 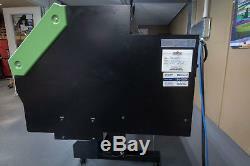 Roland CAMM-1 series cutter blade. 0.4 (10 mm/s) to 23.6 in/s (600 mm/s) (0.4 to 11.8 in/s in media feed direction). 0 to 0.0591 in (0.000 to 1.500 mm). 0.000984 in/step (0.025 mm/step). Error of less than ± 0.3 % of distance traveled, or ± 0.012 in (0.3mm), whichever is greater. Error of less than ± 0.4% of distance traveled, or ± 0.012 in (0.3 mm), whichever is greater. When distance correction ([CUTTING MENU] -[CALIBRATION]) has been preformed: error of less than ± 0.2 % of distance traveled, or ± 0.004 in (0.1mm), whichever is greater. ± 0.004 in (0.1mm) or less. Alignment accuracy for printing and cutting. ± 0.020 in (0.5mm) or less. Alignment accuracy for printing and cutting when reloading media. Error of less than ± 0.5% of distance traveled, or ± 0.012 in (3mm), whichever is greater. Maximum 44 lb (20 kg). Ethernet (10 BASE-T / 100 BASE-TX, automatic switching). AC 100 to 240 V ± 10%, 50/60 Hz. 115.2[W]x44.1[D]x49.6[H] in (2925[W]x1120[D]x1260[H] mm). 86.6 [W] x 32.3 [D] x 49.6 [H] in (2200[W] x 820 [D] x 1260 [H] mm). Temperature: 68° to 90°F (20° to 32°C) (72°F [22°C] or more recommended), Humidity: 35 to 80% (no condensation). Temperature: 41° to 104°F (5° to 40°C), Humidity: 20 to 80% (no condensation). 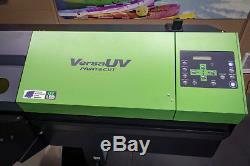 The item "Roland LEC-540 54 UV Printer and Cutter" is in sale since Thursday, August 2, 2018. 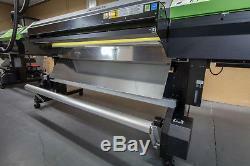 This item is in the category "Business & Industrial\Printing & Graphic Arts\Plotters & Wide Format Printers". The seller is "btmarlin2011" and is located in Bend, Oregon.